Because of all of that and more, I made a #bookaday goal to read aloud a picture book to my 7th & 8th graders each and every one of the 180 days I will meet with them this year. That doesn't mean we won't be doing other reading also, but we will read at least one picture book every day this school year. I'm excited to see where this takes us. Next week I'm planning to read I Want My Hat Back & This is Not My Hat by Jon Klassen and Sam and Dave Dig a Hole by Mac Barnett illustrated by Jon Klassen at the start of the week. Thank you Donalyn Miller for #bookaday leading to the inspiration for this goal in my classroom this year. The entire year went so well that I'm doing it again! I also had the opportunity to present a session about my #classroombookaday at nErDcampMI in July. The slides from that presentation are below if you want to see more of my thoughts after the whole year of a #bookaday picture book read aloud with my middle schoolers. As with any presentation the first time talking about a topic, there are things I would change for next time, but it's a start. I was again able to present a session at nErDcampMI in July with my friend, Angie Huesgen, who is an instructional specialist in St. Louis, and adopted classrooms in her school to do #classroombookaday even without her own classroom. Though I left the classroom, I still see the power of sharing these picture book stories with students. The 2016 slideshow is below. Another change in career path has led me back to grad school (again!) for an MLIS and I'll be starting as a K-5 Library Media Specialist this fall. I'm thrilled to be getting back into a school to talk books with kids and get back to #classroombookaday with students as a school librarian! I often get asked about title recommendations or books I use for #classroombookaday. Here are several places to start to find picture books I would recommend for sharing with students. I was the guest poster at Nerdy Book Club on July 3rd with #classroombookaday & the Power of Shared (Picture Book) Stories, which includes testimonies from many other teachers who have participated in #classroombookaday the last two years. I'm grateful to the Nerdy community for the chance to share and for the support. I was honored to be able to present again this year for nErDcampMI Day One on Picture Books Every Day & the Power of Shared Stories. 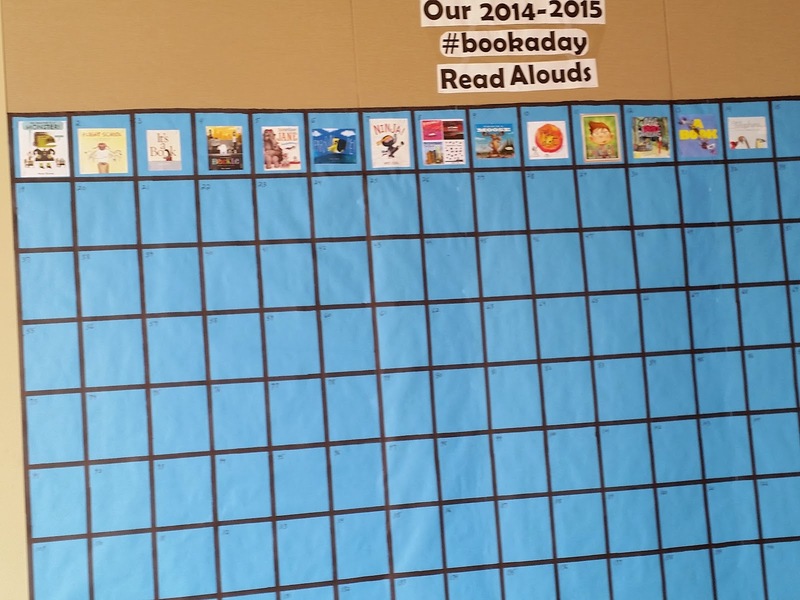 With other teachers participating, you can follow the #classroombookaday hashtag on twitter. And, if you're participating in #classroombookaday, join our facebook group! If you decide to try it, I'd love to hear from you! I think I am in love! I just found your from a link on FB and am so glad I did. I am a writer/blogger and reading specialist (by training- not currently working). I am also the mom of a 6th grader and a 3rd grader. My oldest just entered middle school and I am feeling so very worried about her language arts curriculum. This post has given me hope that there might still be good middle school teachers in her future (if not this year!). I love, love, love what you are doing here. Please keep posting! I just requested all the titles here that we haven't yet read (and some that we will read again!) so that I can do a picture book a day at home. Thank you! This is amazing, Jillian. I am glad that this idea has taken off in your classroom. Keep us posted! What a great idea! (well, if it came from Donalyn Miller, that's no surprise). I encourage parents to give older kids access to picture books and encourage "3 Bears Reading" at all ages - some books below their level, some above, and some just right. As an adult who loves kidlit, especially picture books, I think this a wonderful gift you are giving to your students - and to yourself! I am new to middle school LA (formerly elementary level, then math, now back to my love LA) and struggling with fitting it "all" in! So how much time are you allotting to read aloud? I love the idea! Fitting it all in is always a struggle! I am aiming for just using the five minutes, but depending on the book and discussion, sometimes we go a bit longer. This is just amazing. As a seventh grade teacher, (Year 8 in New Zealand) I am very inspired. I would love to do this with my class. Do you still have time for a class novel/ novel read aloud as well or is this instead? I always love your book recommendations too and have purchased huge numbers of books for my class library based on what your learners have recommended. Thank you! I am finding that I don't seem to have time right now for a novel read aloud, but my students are independently reading 15 minutes at the start of every class also, then the picture book read aloud, which leaves about 45 minutes for the day's lesson (workshop format). I do plan on trying to fit in a novel read aloud later in the year once our routines are more engrained and we're past our required science fair research project. Mrs. Heise- I absolutely want to do this next year! I am replying to this feed because I have a similar question to Bridget and I saw your comment was from 2014. With more experience and time to implement this project, have you been able to figure out if it is possible to still do a class novel read aloud as well? Thank you! Hi Natasha, Yes, I did find I was able to still do novel read alouds. It wasn't every day/month depending on what we were doing in our units, and I was selective about that time, but I made it work when it made sense. The great thing is we had so many common texts we were able to reference when working on reading skill and responding to text. Thanks so much for sharing! What a great idea! It's a great way to build a community around reading! THIS is exactly what I NEEDED. THANK YOU!! I am switching grades from 3 to 4 and I am trying to change my traditions to make it new for the 6 students I will have in my class that I had in 3rd grade. I am in love with this concept, but still need to figure out the logistics. Your blog helps me process this and is exactly what I needed. Thanks for making thinking visible. Any suggestions on how to make the chart? Thank you!! I had an aide make mine (which is why it looks so good! ), but I specified 180 squares, so he measured the board and did the math to make it work out evenly. I do recommend having it in a hallway if possible because it had unintended community-building benefits also! I am going to be teaching a middle school Informational/Media Literacy block. Do you think reading fictional books in this block has a place?